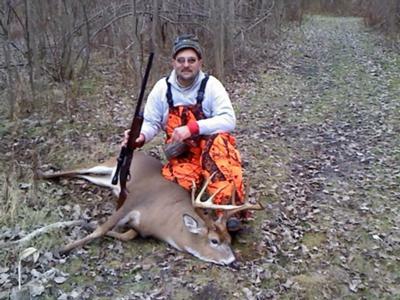 This is an 11-point buck and here is the story. A very good friend of mine for over 20 years started hunting with me and my son when his son got called up for active duty. We hunted on my land a couple years with no luck. So this year his son returned from active duty and at the same time he inherited some property in Newstead NY. We went out the week before opening day shot gun to scope out the land and see where the deer where traveling. I found a very heavily traveled area with fresh droppings, so that was my spot. I didn't get there opening day, but did make it on 11/21/2010. After I traveled back into my spot I got my self in a perfect spot hidden by thorn apples and tall brush. I didn't mention my ATV was in a little valley not to far away so it was hidden. Another thing I didn't mention is I was hunting with my deceased fathers gun. Well to get back to my story... my son was walking further down the road when he saw this monster buck cross the road. He texted me and asked if I was in my spot and I said I was. He texted back that a big one had crossed the road and was coming up behind me. I told him to leave me alone and 25 minutes later the buck was behind me. It came out 20 yards from me and I shot it in the left shoulder. I found the deer 70 yards away.